In 1896 gold was found in the creeks around present day Dawson City, Yukon. As word of this find spread to the outside world, hundreds of thousands of gold rushers began the journey that would hopefully take them to riches beyond their wildest imaginations. Fueled by newspaper reports and merchants hungry for business, they purchased supplies and paid for passage aboard vessels headed to Skagway, or nearby Dyea, Alaska. From here they would first travel by foot over the coastal mountains to Lake Bennett, and then by boats they constructed, via the Yukon River to Dawson City. The greatest movement of gold rushers took place during the fall, winter, and spring 1897/98. The favoured route from coastal Alaska was the Chilkoot Trail. The Chilkoot Trail had its beginnings as a trade route used by Tlingit natives with the native peoples of the interior. 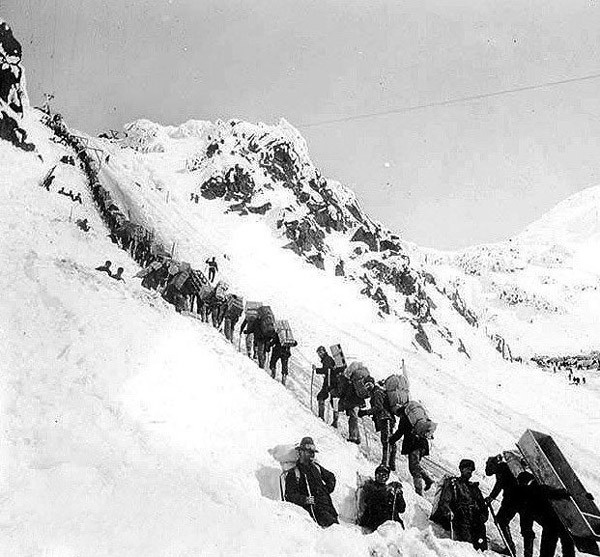 The Chilkoot, although steeper that the alternative White Pass route to Lake Bennett, was the choice of most of the gold rushers as it was the most direct and least expensive way to get to Lake Bennett. It was an arduous and dangerous undertaking, froth with freezing cold, avalanches, and crooked personalities intent on separating the travelers from their money. Each gold rusher was required to carry enough supplies and food to survive the harsh and unforgiving hostile environment of the north. This requirement was enforced by the Northwest Mounted Police at the top of the Chilkoot Pass. Upon reaching Lake Bennett, the time was used to construct every form of vessel to take them via the Yukon River to the Klondike. After a long winter, in May of 1898, the ice on Lake Bennett broke, and a flotilla of over 7000 vessels began the final push to the gold fields of the Klondike. Although the Chilkoot Trail is only 53 km/33 mi, it is estimated that the work of moving and caching a ton of goods to the terminus at Lake Bennett would result in the average gold rusher having covered about 1200 km/750 mi in total. “Sourdough” was the name assigned to anyone who had wintered in the north. The gold rushers were called “Chechako”, a Tlingit term meaning greenhorn, or newcomer. The top of the Chilkoot Pass was the border between Canada and the United States. It was an arbitrary border established by the Northwest Mounted Police and their Maxim machine gun. The final agreed upon border between Canada/US would be decided after the goldrush. Many famous people took part in the Klondike Gold Rush. These include Jack London – writer, Duff Pattulo-premier of BC, Tex Rickard – promoter who made Madison Square Gardens what it is, Wilson Mitzer – playwright and owner of Hollywood’s Brown Derby Restaurant, Joaquin Miller – known as Poet of the Sierras & Byron of the Rockies, General Evangeline Booth – co-founder of Salvation Army, Jack Kearns – managed boxer Jack Dempsey, Alex Pantages – began Famous Players Theatre chain and infamous for dumping Klondike Kate, Martha Jane Canary – better known as Calamity Jane, Augustus Mack – founder of Mack Trucks, Sid Grauman – builder of once named Grauman’s Chinese Restaurant [where famous celebrities put feet and hand prints in cement], and Thomas Edison.